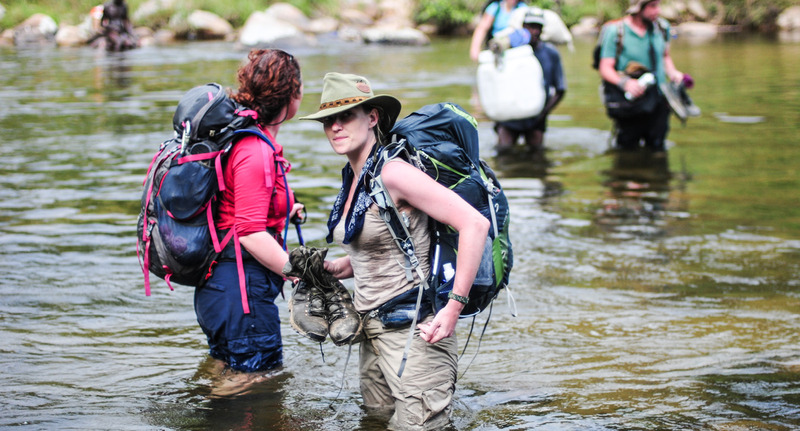 First time Secret Compass teammate Helen had plenty of travel and backpacking experience when she joined the Madagascar Peak-to-Sea team, but had never been on a ‘real expedition’. Here we talk to her about the rewarding yet exhausting trek, the ups and downs she faced – physical and mental – and why she’s now a Secret Compass veteran, with four expeditions under her belt. I’m a Veterinary Surgeon and own two clinics in South London. I have backpacked all over the world and enjoy long distance walking, especially in remote areas. The more uncomfortable the better! How did you hear about Secret Compass? I went to an Escape the City evening where Levison Wood (co-founder of Secret Compass) was talking about his transition from being a soldier to setting up his own expedition company. It was exactly what I was looking for as my next challenge and I came away from that evening feeling very positive and inspired. What drew you to the trip? As soon as I heard that Secret Compass was planning a trip to cross Madagascar, I knew it was the trip for me. I put my name on the application list way before the trip was finalised and I think I was the first person to be accepted to be part of the expedition! What did you hope to see on the trip? I wanted to see a part of Madagascar that barely anyone else has. It’s a very hard country to explore as there is so little infrastructure and the roads are horrendous, so walking seemed the obvious way to explore it. I hoped to experience rural village life in a country I knew very little about and I found it hard to do any research as hardly any one else has explored the interior either. 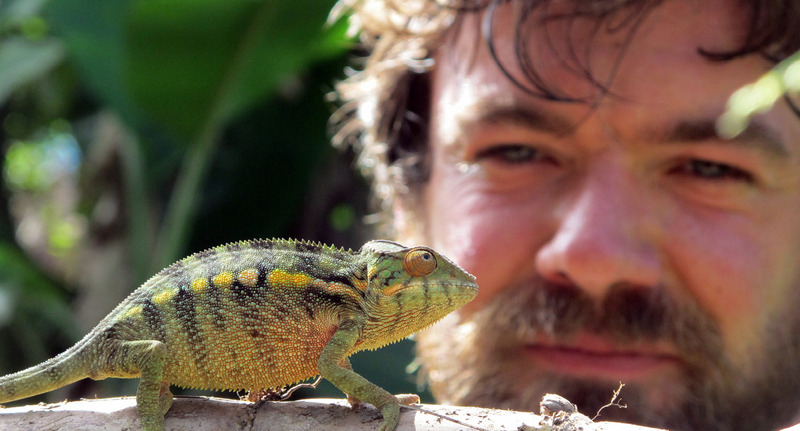 I also wanted to trek to remote places, through primary rainforest and hopefully see some of Madagascar’s weird and wonderful wildlife, which certainly didn’t disappoint. I trained hard to improve my fitness and endurance by doing long walks in the Lake District, Peak District, or the South Downs whenever possible. This was difficult due to my busy work schedule, so during the week it was 6am starts for boot camp in the park – particularly unpleasant in January at minus 4 degrees in the ice and snow. But it was all worth it in the end as my body held up well on the trek (my feet didn’t fare so well after foot rot set in!). How aware were you of the conservation situation in Madagascar? From documentaries and articles I had heard quite a bit about the logging situation, particularly in the North East of the island, which is where we started our walk. Due to the unstable political situation there has been no one to police the destruction of the rainforest for mahogany and rose wood trees, which are worth a small fortune. The devastation of the forest means a diminishing habitat for Madagascar’s unique wildlife, including its most famous animals the Lemurs, most of which are now endangered. I was concerned that the forest we would walk through would already be logged, and although much of it had been in the 50 years since the maps we were using had been made, we still climbed our way through some completely untouched and dense forest and saw plenty of wildlife, including some lemurs which we were all delighted about. I have walked the length of New Zealand which was a nice long walk, and have spent time in the jungles of Borneo many years ago, so I knew that I could cope with the climate and endurance aspect of this type of expedition, but nothing can really prepare you for travelling in an area in which no one knows what to expect, as no one has ever walked through it. However, I absolutely loved that aspect of it. There were plenty of brief despairing moments, including putting on wet kit on a cold morning half way up a mountain, when your muscles are still aching from the long days before and your pack weighs a tonne. Also being hot and sweaty in the jungle and being covered in biting sandflies and leeches whilst getting your hands covered in tiny thorns from the local “hairy” bamboo, was not a highlight. However, an internal chat with myself to look around and see where I was in the world and how amazing the whole experience was, soon cleared any doubts from my mind. I thrive on a challenge, and knowing that there was no way back, made me just grit my teeth and move forward – the quicker the better during difficult times. A good swear helps too! Summiting Mt Maromokotro was amazing as so few people have ever been there and it was a long and tough climb to get there. The view from the top was stunning and the team spirit was soaring. What were the physical challenges? Climbing up steep hills in the jungle was tough, especially when you had very little visibility and had no idea when you would ever reach the ridge up ahead, or even where it was. We were often climbing over huge slippery boulders covered in moss and tree roots, with vast holes underneath, where I imagined all sorts of snakes and badness could be lurking if I fell in. The jungle is also a tough environment mentally because of the lack of perspective and the constant dampness, which does nothing for moral. There were four women on the trip and nine men. The fitness and mental strength varied across the sexes and I wouldn’t say the women fared any worse than the men in this respect. The comradery between the team members for me was the most defining part of the trip. We had 13 people in the team from across the world, with all sorts of expedition and travel experience. I absolutely loved the evening chats around the fire, and swapping stories of past adventures. It was incredibly inspiring to be surrounded by such a fascinating bunch of people, and has made me want to achieve so much more, and made my feet even itchier to experience more of this amazing world. The Malagasy are incredibly polite and gentle people. We were greeted with fascination in every village we travelled through, as barely any person had ever seen a foreigner before. 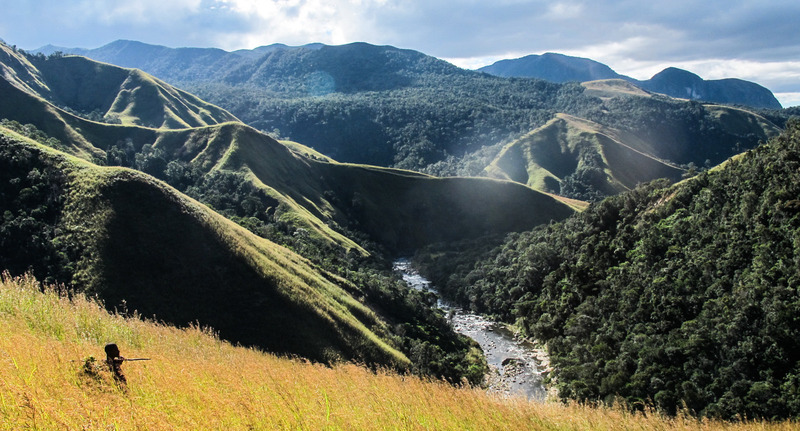 The last foreigners to travel through this area were most likely the French in the 1940s, which is a generation before any of the people we met were born, given the short lifespan of the rural population in Madagascar. 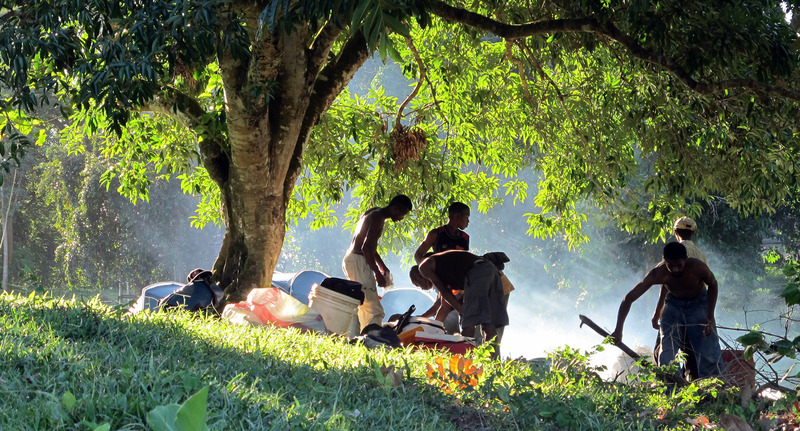 We camped on village football pitches where possible and attracted huge crowds of people who just wanted to watch us go about our ritual of putting up our tents, washing, drinking tea and having our supper. The guides who came with us were absolutely hard as nails. Whilst we wore our Gortex boots and technical clothing in the jungle to protect us from bugs and beasts the porters literally just wore pants, with bare feet. In this way they could see the leeches easily and remove them with a piece of tobacco leaf. When they finally put on their plastic jelly shoes we knew that things were about to get serious!! They sang together whilst they carried their incredibly heavy loads and told us that they loved seeing some of their own country, just as much as we did, as most of them had only ever travelled in the area around their own villages. How did you feel being a ‘Vasa’ in the villages? It was a huge privilege to be the first foreigner that most rural people had ever seen, but also gave us a big responsibility to be polite, say hello to each and every person we met along the way, and try and support the local economy by buying local fruit and vegetables along the way. How did it feel to come home? Elated and proud. It is an amazing feeling to be part of the first team to have ever walked right across Madagascar and to have climbed it’s highest mountain! Since then, I have slipped back into the stresses of work and life in the city and dream daily about being back in the middle of absolutely nowhere, not knowing where I would be pitching my tent that night, and I cannot wait to go on another adventure with Secret Compass! 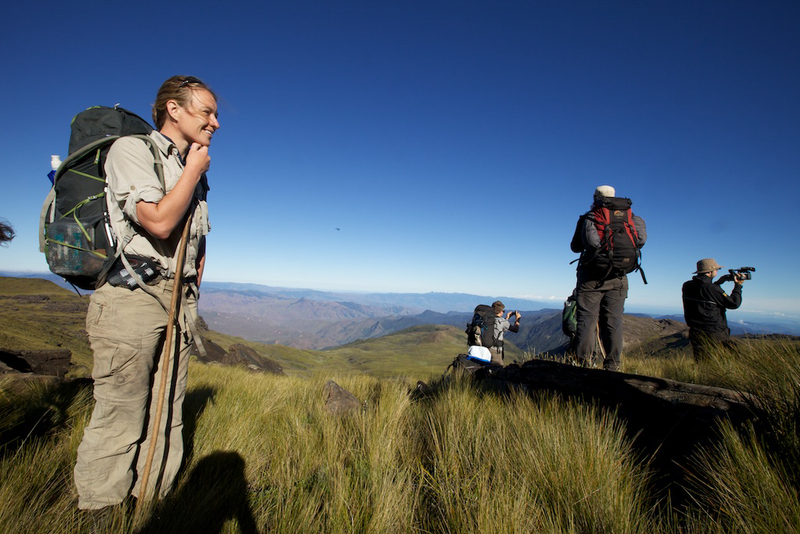 Helen has now been on Secret Compass expeditions to Madagascar, Afghanistan, Socotra and, most recently, North Korea. Written by Helen Spencer (@Secret_compass).